Rename any item in your inventory to whatever you like. Attention: This mod is no longer being supported or updated. This mod has been uploaded by "The Care Taker" at the request of its owner. The Care Taker account is run by Nexus Mods for the purpose of hosting mods created by authors who are no longer active in the community. If you are a mod author and would like to learn more about this service or have questions, you can find details regarding The Care Taker HERE. This is a simple mod that will allow you to rename any item in your inventory using an MCM menu. 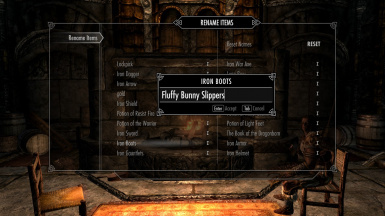 The name you change an item to will be applied to all items of that type, so if you decide to rename "Iron Boots" to "Fluffy Bunny Slippers" then all "Iron Boots" you come across in the game will be displayed as "Fluffy Bunny Slippers". The changes are only retained in your save game so it won't affect any item names permanently on different playthroughs. You can feel free to make translations, upload this to other sites, and generally share this with anyone you like without asking for permission so long as you don't try and make any money from this mod. I only ask that you make sure to give me credit for this work. You do not have permission to port this to Special Edition as this relies heavily on SKSE and I don't want to deal with complaints people may make about this not working due to the differences between the 32-bit and 64-bit versions of SKSE that someone else did not compensate for. You also do not have permission to use any part of this mod in your own mods without asking for permission first.